Father Stephen was born in Atlanta, Georgia October 1, 1968. He was baptized in the Methodist Church soon after his birth. His parents are both believers and taught him from the very beginning about God. He was three years old when he started asking questions and very soon after gave his heart to Jesus Christ. His family was very instrumental in his spiritual growth and he was blessed with a strong foundation in Christianity. Stephen graduated from Georgia State University with a Bachelor’s degree in Business Administration. After college He returned to Canton Georgia and to his local non-denominational church, Promised Land Bible Church. In 1997, he along with Father Kurt Wheeler began attending St. Michael’s Seminary after becoming interested in sacramental worship. There God quickly laid on his heart a desire for sacramental, evangelical, and charismatic worship. In 1999, with the blessing of the elders of Promise Land Bible Church he left to help serve Father Kurt with the founding of Christ the Redeemer Church in Canton Georgia. He was ordained on May 5, 2002 by the Most Reverend John Holloway, Bishop of the Mid-South Diocese, to the office of deacon. Stephen was later ordained on September 16, 2005 by Bp Holloway to the office of priest. He was installed as the Rector of Christ the Redeemer on December 11, 2008. Father Stephen serves on the Commission on Ordained Ministry for the Diocese of the Mid-South and on the Bishop's Council. Fr. Stephen and his wife Keisha were married at Big Canoe Chapel in Big Canoe, Georgia on December 16, 2006 and now live in Ball Ground. She is a graduate of the University of Georgia and holds a Master’s in Social Work. Keisha also plays an active role in the church serving in the areas of the praise team, women’s ministry, and the dance team. They are the proud parents of Joshua and Daniel, ages 10 8. Father Justin Allen was born in St. Louis, MO and moved to Cherokee County as an adolescent. He is a graduate of Sequoyah High School, and is currently working on his undergraduate degree in Christian Counseling. Justin has been a leader in the Transformation Series, the Alpha Course (www.alphacourse.org)," the Living Waters program (www.desertstreams.org), and Elijah House Ministries (www.elijahhouse.org). He has completed the Living Waters Leadership Training Course, receiving credit as a certified instructor for the program. His passion throughout all these classes is small group ministry and counseling, where he truly exercises his gift of exhortation. 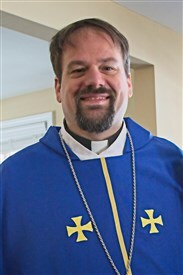 In 2001, he became a Licensed Liturgical Minister in the Charismatic Episcopal Church, and was ordained as a deacon by the Most Reverend Bishop John Holloway on April 18, 2004. He was ordained as a Priest on November 20th, 2016 by the Most Reverend Bishop David Epps. 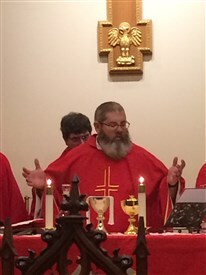 He assists Father Stephen with the Catechism course, and is currently the church liturgist, responsible for the preparation of the liturgy for each service. He is enrolled at St. Michael's Seminary working on his Masters of Theology and is also working on a Christian Counseling Certification through Sarasota Academy of Christian Counseling. Justin's hobbies include motorcycles and four-wheelers, woodworking and home improvement and volunteers with his son’s Scout troop. Justin married Luanne Hilburn, a member of the Christ the Redeemer family, in February of 2003, and they live in Woodstock. Luanne is employed by Datatrac Corporation where she is a Project Manager. She is a graduate of Georgia State University with a Bachelor’s of Business Administration, and holds an MBA from Campbell University. Luanne is also an active part of the church family, serving as leader of the Children’s Ministries and as the Volunteer Church Administrator. They are parents of two children, Madelyn, age 14 and Seth, age 12.